I was supposed to post this last week but since I had been busy, I wasn't able to keep you guys updated. What person wouldn't get worried seeing this?!? 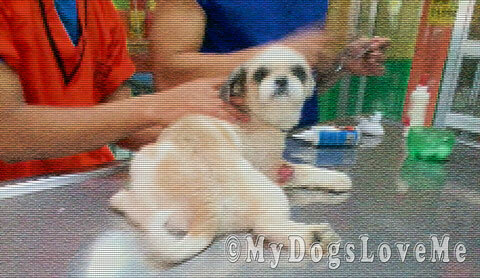 We're in the Marikina Veterinary Clinic again, by the way. For the record, this is the first time I've ever seen a blood blister! The vet had mentioned it to me in Tagalog ( the primary dialect here), which I'm not very good at. A friend of mine (his name is George), who I had explained my concerns to, told me thoughtfully what it actually was in English. 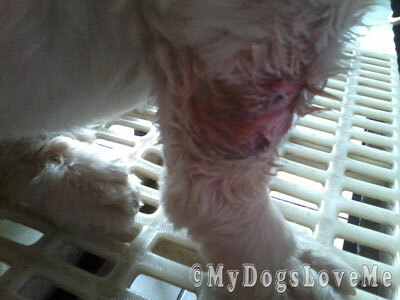 I went down to check on Buchi that morning and found him bleeding through his fur. He sleeps in his giant "crate" which had me wondering how in the world he got it. So without wasting time, we once again went to the vetty! 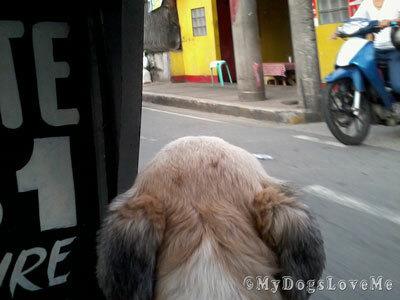 So here we are again riding the tricycle to the Marikina Veterinary Clinic. I thought after the aggression issues that he and Whitey have been having, I'd have a time of peace even for some short while... but no, this had to happen! Fortunately, Buchi has learned to be a good patient. There he is getting his ear hairs plucked. Our tiny veterinarian checks him out and removes the fur in the bloody area. He then gets injected with antibiotics in one back and front leg. 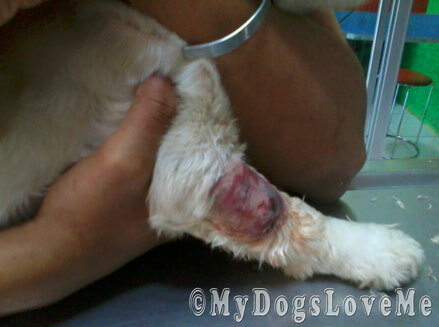 All in all, we spent about 350 Php (approximately $9) on this vet visit. As I've mentioned before, the Marikina Veterinary Clinic provides the best veterinary service EVER. We were only charged for the treatment which was basically the blister clean-up and the two shots Buchi got. Consultation is, once again, free. Update: It's a lot better now. Now, I can take a deep breath again. Update 2: I've been hearing some really sad news from our Bloggy friends. Freddie Spaghetti is having a really bad case of hip dysplasia while Poppy Vic of Zoolatry and the Magnificent Mango had just passed away. Please find the time to visit them and show our blogging community's support. Accckk, our human would be freaking out, seeing that. Purrs for speedy healing! P.S. Our human just cannot imagine vet care being so inexpensive, let alone GOOD vet care. Amazing. OMD! I am glad that everyone is better now!! That looks awful. Send healing paw to dear baby. Have a wonderful Wednesday if you can. Good grief, glad it's doing better. OMG! Poor Buchi! that looks nasty. I sure am glad it's been looked at and hope he feels better real soon! Ouchy. That looks so sore. Isn't it so sad about fred? he's so young, it breaks my heart. i'm hoping monday, with the new update, there will be some hope. anyway, i've only seem blood blisters in humans, usually they are small and resolve on their own. but that one looks painful!! thankfully for you, there are vets that seem to care for animals more than money by charging just for treatments. Eeek. That looks really painful. So glad it's healing well and Buchi is well on the road to full recovery. Actually the grass was labelled as "pet grass" and can be eaten by both dogs and cats. I offered it to Whisky but she just glared at me and walked away. Hahaha! Wow, that doesn't look anything like what our humans get for blood blisters. That is really nasty. So glad you got Buchi to the vet and hope the med work. Very, very sad times in Blogville. We are still in shock about the sudden passing of Mango. Poor Buchi! We sure are glad you're doing better today. Marikina Vet Clinic sounds wonderful. I am so sorry for your ouchie. It looks awful and painful but I am furry happy your Vet was able to help you. Sounds like you really have a great Vet! Paws crossed your leg heals and that blood blister never returns. On a side note, ear hairs plucked??! OUCH!! Yes, very sad news around the blog-o-sphere. Not a happy Wednesday. OMD, I am so glad that you are better...it looked terrible! There is so much terrible news floating around with our friends...makes me very sad. We've never heard about a blood blister in dogs. We're glad it's on its way to healing. SHE is flabbergasted at $9....it costs us about $55 just to walk in the door. We are so sad for our friends who are ailing and of course, for Mango's family. Amazing that tears are being shed all around the world for the huge guy. Poor Buchi! But so glad he is doing better :) Hope he heals completely very soon. Oh no! That looks awful! oh dear...that makes me cringe...healing energy being sent your way! all in prospective, though, considering what others are facing. Ouch! That looks very painful. Hope you feel better soon friend. We are purring for you, that looks awful! I wish our vet only charged $9 for a visit and 2 shots! Poor thing! I hope Buchi is doing much better now. Awe, that looks so sore...hope it feels better soon! I hope it gets better soon! Mowzers, Buichi! That looks uncomfortable!! How'd you get it?